Today’s positive trading demonstrates the lack of selling pressure but still not enough bullish pressure to breach the upside of the wedge formation. The sideways mode of the markets continue to accentuate the analysis of each individual stock chart versus depending on the market trend to assist in price moves. Both long and short positions should remain in the portfolio. Currently the market indexes are trading above the T-line but still below the downward resistance level. The T-line continues to act as a viable factor. The Dow could not get up through the T-line yesterday and is selling off. The NASDAQ and the S&P 500 closed above the T-line yesterday but Today those indexes have pulled back to test the T-line as support. This demonstrates the lack of any bullish follow-through of yesterday but also illustrates the lack of any major selling pressure. The sideways mode of the market is still in progress as illustrated by the wedge formation. Continue to stay both long and short. Yesterday’s Doji in the indexes gave a better view of whether the market was still in a sideways trend or whether the 200 day moving average was going to be the next target, the bottom of the trend channel. Today’s gap up, especially in the NASDAQ, illustrates the lack of any overpowering selling pressure. Although Today’s positive trading reveals the downtrend is now more in a sideways trend, the sideways trend remains the prominent direction until there is a breakout through the upper resistance level. Continue to have both long and short positions in the portfolio provided they are not violating the T-line. Everybody likes credits. We want credit for the work we do. We get credits for taking college classes. And, of course, we love our credit cards. It only makes sense that when using vertical spreads, we should love the credit spread over the debit spread. A credit spread is simply the seller to the trader who bought the spread. The buyer pays a debit. The seller gets the credit. Well, you don’t need to know anything about options to figure out that the credit side is better, right? Actually, you do need to not know anything about options to believe it’s true. There’s always a debate among traders over debit and credit spreads, so let’s be sure you understand the art and science behind these two sides of the same trade. As a refresher, a vertical spread is the purchase of one option and the simultaneous sale of another. Both must be the same type (calls or puts) and have the same expiration date. For instance, if you buy a Facebook May $160/$165 call spread, you’re buying the $160 call and selling the $165 call. Because lower strike calls must be worth more money for any expiration, this is a debit trade. However, you can get the identical risk profile by selling the same put spread – same strikes and expiration. If you sold the $160/$165 put spread, you’d have the same risk graph. And yes, it will be bullish too. It will be identical to the call debit spread. However, because you’re the seller, you’d receive a credit. And it’s at this point that most traders immediately jump to the conclusion that the credit trade must be better. After all, everybody loves credits. However, when you buy a spread, you have rights. You own something that might appreciate. But when you sell a spread, you have an obligation equal to the difference in strikes. You can think of debit spreads as assets and credit spreads as liabilities. Part of the misperception with credit spreads is that traders think they’re earning a credit to take on an asset. They’re not. They’re getting paid to accept a liability. For example, by selling the $160/$165 put spread, you’re long the $160 put and short the $165 put. 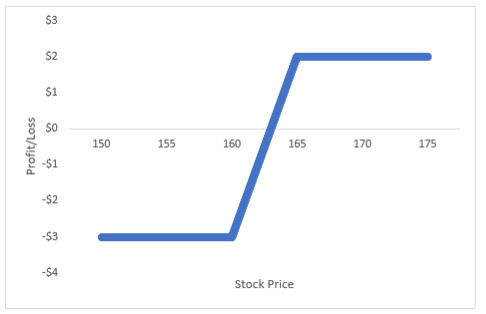 For puts, higher strikes are worth more money, as you have the right to sell shares for more money. Therefore, to receive a credit from this position, you must be selling the $165 put – that’s what’s providing the overall credit. Now check your rights and obligations: If you sell the $165 put, you have the potential obligation to buy shares for $165. By purchasing the $160 put, you have the right to sell shares for $160. Buying shares at $165 and selling them at $160 is a five-dollar loss. There’s no asset anywhere in the equation. It’s a five-dollar liability. That’s why you’re getting paid to accept the trade. Spread sellers act like an insurance company. They’re collecting a smaller amount today, say $2, to insure a larger loss, say the $5 difference in strikes. Here’s the important relationship you must understand to find which spread – the debit or credit – may be most effective: Buying the call spread is identical to selling the put spread. How is that possible? Go back to the original $160/$165 call spread trading for $3. That’s an opportunity to pay $3 and potentially make $2. However, the if it’s trading for $3, the $160/$165 put spread must be selling for $2. By selling the spread for $2 that’s the most you can make, but you may lose $3. Wait a minute, that’s exactly the same as the call spread! Exactly right. There is no difference. To take it a step further, if you buy the call spread, your broker will debit your account $3, or $300 total, to buy the call spread since that’s the most you can lose. However, if you sell the put spread for $2, the broker will still debit your account for $3 since, again, it’s the maximum you can lose. Brokers don’t care how much you can make. They do care about how much you can lose, so the margin requirements are always pegged to the maximum loss. No matter how you cut it, a debit spread is a credit spread. There’s no reason to automatically prefer one over the other. Why bother learning both? In the real world, you’ll get slight pricing discrepancies due to put-call skews. For instance, if you can buy the call spread for $3, you may be able to sell the put spread for $2.20. In that case, you’re better off with the put spread. You can make more ($2.20) and lose less ($2.80). But many times, skews work the other way. If the call debit spread is trading for $3, the corresponding put spread may be selling for $1.80. Now you’re better off buying the call spread – even though it’s a debit trade. Options trading is the most rewarding, but it’s even more rewarding when you understand the finer points – the art and science of options trading. Now that you understand, give yourself some credit. The market indexes currently trading relatively flat after trading lower earlier indicates there is still some potential bullishness that is offsetting the selling of the past five trading days. This does not mean an uptrend is about to start, it merely implies that the sideways motion of the market is probably still in progress. Investor sentiment is still on the bearish bias, but not with the aggressiveness of yesterday. Additionally, the transportation index is trading up strong today, not implying a reversal but more of a stabilization in the markets. These conditions continue to warrant having both long and short positions in the portfolio. This is why we recommend Trend Analysis. Nothing has changed the nature of the market trend, the slow lower drifting is the expectation of the sideways moving market indexes. These market conditions usually do not warrant going after anything aggressively but it allows for the evaluation of chart pattern setups that can be anticipated to be good trades if/when the market turns back up. Wildly unexciting! Although the market indexes are trading slightly positive, they are still trading at the exact same level of where they opened today. The indexes close below the 50 day moving average as well as the T-line on Friday, creating the prospects of a sideways moving market. Today’s lack of conviction is helping to confirm that analysis. Anticipate a boring trading day. Although LABU is forming a bearish McMuffin, a few of the biotech’s are showing good strength. As somewhat anticipated, the markets are continuing to consolidate back to the support levels of the 50 day moving average and the T-line. The uptrend remains in progress as long as the indexes stay above the T-line. These are type of days where the uptrend remains in progress but profit-taking is occurring, making the analysis of each individual stock chart more important. Continue to stay predominantly long. Over the next 13 weeks, Devon Energy has on average historically risen by 7.5% based on the past 29 years of stock performance. The holding period that leads to the greatest annualized return for Devon Energy, based on historical prices, is 4 weeks. Should Devon Energy stock move in the future similarly to its average historical movement over this duration, an annualized return of 67% could result. Over the next 13 weeks, First Solar has on average historically risen by 8.9% based on the past 11 years of stock performance. The holding period that leads to the greatest annualized return for First Solar, based on historical prices, is 1 week. Should First Solar stock move in the future similarly to its average historical movement over this duration, an annualized return of 144% could result. Over the next 13 weeks, ISRG has on average historically risen by 16.1% based on the past 17 years of stock performance. The holding period that leads to the greatest annualized return for ISRG, based on historical prices, is 12 weeks. Should ISRG stock move in the future similarly to its average historical movement over this duration, an annualized return of 74% could result.